Snow room, complete with Snow Dog! 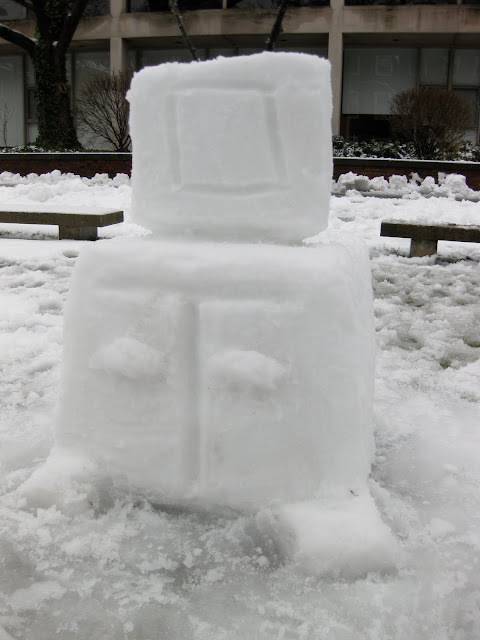 Whenever there's a huge snowfall, I start thinking about things to make in the snow. And, after starting a fun snow chair project, I got excited about building an entire snow living room. Annnnd, I did it! Ta-da! The snow room comes complete with snow cat on a cushion, snow dog, snow chair, TV, footstool, and TV stand. There's even a rock remote control on the arm of the chair. My tools were basic -- a rock and my hands -- and the project only took about 5 hours total over two days. I'd rank this among easy snow sculptures most people should try. Snow Cat sits on a cushion closest to the viewer. The snow room did not go unnoticed. The Harvard Crimson, Harvard's student-run newspaper, ran a story about the snow living room, "The Latest in Furniture Trends," in their FlyBy Blog. The snow room also caught the attention of the local kids. A couple of young neighbors saw me at work and wanted to jump in right away. As far as things to make in the snow go, the snow room is a pretty good idea, especially if you have kids who want to help out. When you get more than a few kids building something in the snow, it can quickly lead to conflict without an adult who can act as a skillful moderator. Not so with a snow room. I gave each kid a separate piece of furniture to become the master of. One little girl took over the snow cat and snow cushion. 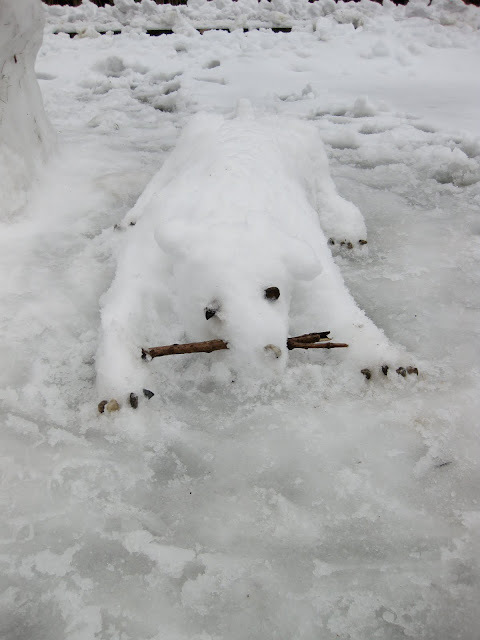 Another took over the snow dog and his rock claws. I worked on the TV and TV stand. View of the fun snow room from the side, complete with Snow Dog and Snow Cat. Snow Dog, a happy member of the snow room. Is a snow room complete without a snow TV? No. If this inspires any of you to make your own snow room, let me know! I'd love to see what you come up with and hear more ideas about things to make in the snow. And, if you like the snow chair and the snow living room and you're looking for more fun snow ideas, you might also like these snow penguins I made.